Anil: Thank you for taking the time for this interview, let's start with a brief overview of your background. Kathleen: I have been in executive management in the software industry in the United States and abroad since 1988. During this time, I have held several CMO positions, including positions at Stamps.com and Websense. I have also been CEO and president of a few companies, including Rogue Wave Software and a division of Seagate Software. I have a Ph.D. in Management and International Studies and have taught international marketing at the graduate and undergraduate level. I have written two marketing and business-related books and have authored published articles on marketing and strategy. Anil: What are the names of the books that you wrote and tell me a little about those books. Kathleen: High-Tech Strategies in the Internet Era is an A – Z guide for strategy development for high tech products. It has been used at a couple of technical colleges. The book starts with helpful advice on how to go about the research process to identify new products. It then moves to validation, getting buy-in and execution through a technique called strategy deployment. Watch Your Back is a book of fiction. I know how tedious it can be to read business books, so I decided to try to convey teachings about some of areas of business – most specifically, organizational behavior and the functioning of a board, which are not regularly taught – using a fictional approach. Anil: Cool. Tell me about your new role at WebTrends? Kathleen: I have quite a few objectives. I hope to position the WebTrends marketing organization as a showcase for optimizing digital marketing by using our products and those of our partners. The development of a new product strategy will include validating requirements for our current product portfolio and evaluating complementary additions that simplify the life of today's online and offline marketer. I'd like to see the company increase communications that provide helpful advice for translating the data customers receive from our products into actionable changes to their marketing campaigns. I will also lead an effort to build up our presence in international markets, and an overall refresh of the WebTrends brand. Anil: Tell me more about "I'd like to see the company increase communications that provide helpful advice for translating the data customers receive from our products into actionable changes to their marketing campaigns." Do you mean building strategic consulting practice or expanding partnership with strategic consulting companies like us or something else? Kathleen: Something else. WebTrends wants to share our expertise with our customers. We will be putting together seminars, articles and white papers with the aim of helping clients and others to maximize the use of the data they receive from our products to improve the effectiveness of their marketing campaigns. Anil: What are the challenges you see at WebTrends today? Kathleen: The WebTrends brand is globally recognized as the pioneer of, and leader in, website analytics, but many do not equate WebTrends as being a leader and innovator in the broader industry of Enterprise Marketing Software (EMS). The process of refreshing our brand to be an innovative global EMS vendor is a challenge the entire company is enjoying. Anil: What is your plan for overcoming this challenge? Kathleen: We have developed a comprehensive strategy surrounding new product deliverables, the development of deeper domain experience, the creation of informative communications, the continuous improvement on the execution of world class online and offline marketing programs and building our international presence. Anil: Where do you see web analytics market heading? What does future look like? Kathleen: We see web analytics market advancing on a number of fronts: (1) Delivering in-depth, visitor-level intelligence that moves marketers closer to the ideal of one-to-one marketing; (2) Being able to more precisely measure customer engagement; (3) Going beyond analysis and reporting to delivering recommendations that improve results; (4) Being a central and foundational component to an integrated EMS solution; (5) Being a significant component in our customers' plans for company-wide business intelligence. Anil: How is WebTrends positioning itself for the changing market? Kathleen: By preparing product, marketing and company strategies that are in line with the evolution of the new EMS industry (as noted above) and that focus primarily on meeting the needs of WebTrends' current and future customers. Anil: The theme of last year's WebTrends conference was customer engagement and WebTrends' Score product was showcased as the solution to measure visitor engagement. How are the customers embracing the WebTrends Score Product? Do you have any case studies that you can share? Kathleen: Interest in the product has been very high. It is a brilliant solution for measuring customer engagement and permitting the segmentation of visitors into product/service preference areas that permit finely targeted follow-on campaigns. We do not have any published case studies for Score yet, but look forward to sharing those with you soon. Anil: What is going to be the theme of this year's conference? Kathleen: We're still finalizing the theme, but we will be sure to give you an update when it is finalized. Anil: Finally, what do you think about Omniture? Their market position and all the acquisitions they are doing? Kathleen: I have taught about the difficulties of acquiring companies and products: such as integrating disparate technologies and merging companies with varying cultures and processes. I think it is unlikely that Omniture will escape easily from many of the inherent problems in company acquisitions. Now, like most, I think integrated marketing software suites are something the market is looking for, but the key will be, as it always is, in the integrity of the integration. It's a question of marketecture vs. architecture. Can Omniture truly integrate the products they have acquired to deliver the synergistic value customers are really looking for? Or will this require an open architecture that easily permits exchanging data among EMS applications? Anil: Great, I think true integration of the solutions is not going to happen. It will be more around creating an easy exchange of data. Thank you for your time. "We'll be making new features and additional information available fairly quickly -- like a specific breakdown of how viewers discovered the video"
YouTube videos are embedded in several sites and blogs, so it will also be nice to see what sites, blogs etc. are embedded the video on their site and on what pages. Some bloggers, TV news and news sites are claiming that YouTube will track and show at individual level i.e. show the name, IP of an individual who watched the video. I believe that YouTube has such data (when you consider tying Google Accounts with YouTube) but I do not believe that YouTube will reveal that kind of information in the Video Analytics, as it could result in all sorts of privacy issues. I expect Google (who owns YouTube) to integrate these services with Google Analytics. Not only will video providers able to see the stats mentioned above in one interface but all see the impact of videos and visitors driven by these videos on their site and hence make better decision for future video productions and promotions. About a month ago, Google Analytics rolled out a new feature called “Benchmarking”. This service shows how your website's statistics compare against other sites. The data used for this service is collected via Google Analytics from the sites that opt-in to use this service. In the beta release of this service, you are able to compare your site's Visits, Pageviews, Pages per Visit, Bounce Rate, Average Time on Site, and New Visits data against benchmark data from categories of other participating websites. After a wait of few weeks, last week I was able to see the benchmarking data for the first time. Benchmarking data is available under “Visitors” section of Google Analytics (See below). As you can see above, this site rocked it had 386% more visits then the benchmark data. Actually most of the stats were better than the comparable sites. Does that mean we can open Champagne and celebrate??? Not so fast. Let’s look at what I was comparing to? According to Google Analytics, I was comparing to “All sites of similar size”. So what does “All sites of similar size” mean? All sites are grouped together under three classifications: small, medium, and large based on number of visits each site receives. You can compare yourself to other similarly sized sites but not to sites in other size classifications. I did not find it very useful since I don’t know what the range of the stats was. If the site I was looking was being compared to one or two page personal sites then sure this site will rock compared to the other site, not very helpful comparison though. I needed to compare to my industry vertical. Google provide a list of site categories that are available for the site size (based on visits) your site falls into. However I was not sure which vertical to pick for this particular site. Some sites fall perfectly in one vertical but a lot of them do not fall into any one vertical, as was the case with the site that I was looking the data for. It would have been nice if Google had allowed me to see which vertical it was categorizing my site in so that I could have picked the same vertical. I know this is only beta release and it will get better with new releases so now I am eagerly waiting for the next release so that I can get some meaningful stats. What are your thoughts on this service? One New York assemblyman, Richard L. Brodsky, has drafted a bill that would make it a crime — punishable by a fine to be determined — for certain Web companies to use personal information about consumers for advertising without their consent. Opt-out for anonymous user behavior: It will force Web sites to give consumers obvious ways to opt out of advertising based on their browsing history and Web actions. Opt-in for using PII data : Users would also have to give explicit permission before these companies could link the anonymous searching and surfing data from around the Web to information like their name, address or phone number. My prediction about Behavioral targeting and privacy is coming true. Earlier this year, in my yearly predictions I said that this is year we will see a greater push for consumer’s privacy. Opt-in system – Some networks (maybe new ones) will move towards opt-in rather than opt-out (I favor opt-in over opt-out as I wrote in past. So I am making this prediction that this year networks will pay attention to it). A new types of networks or services might come up which will allow users to be an active participant in BT and control who can use their online behavioral data and how they can use it." Use of customer’s data without their consent created an uproar in UK last week. In response to the mess created by Phorm and British telecom, Sir Tim Berners-Lee said that his data and web history belonged to him. This is just the beginning; I think, we will see greater push for consumer privacy as consumers become educated about how their data is being used to target them. I think it is time for publishers and ad networks to be proactive about educating customers on how their data is being used and give them clear options to opt-out (or better opt-in) of any targeting. I am big proponent of Behavioral Targeting and Personalization but it has to be with user’s consent. We need to see the online behaviors of visitors from USA and Canada using Google Analytics. In other words we need a profile which only has traffic from USA and Canada. Create a profile in Google Analytics in which you would like to capture visits from USA and Canada. Create a filter that includes visits from USA and Canada only (described below). Apply the filter to the profile that you would like to show the data in. (The filter is automatically applied to the profile that you use to create the filter). Filter Name: Give a Name to your Filter. Filter Type: Select “Custom Filter” and select “Include” in the radio button. We are creating a custom filter to include US and Canada Traffic Only. Filter Field: Select “Visitor Country” as the filter field. Visitor country is populated based on the IP address of the visitors. (Canada|United States). () is required to group all the values together and | is used as on OR. So what this filter patter is telling is to match either one of the 2 values (Canada and United States) in the Filter Field (Visitor Country). Now the question is why did I enter United Sates and Not United States of America of USA or US? You need to enter what Google Analytics captures the country name as. To find out what you should enter in the country name, go to a profile that does not have any country filters. Go to Visitors --> Map Overlay and scroll down to see the names of the countries. Use the name exactly as it shows in this list. Last month I wrote about 3 British ISPs getting into Behavioral Targeting using technology from a company called Phorm. In my blog post, I raised my concerns about Privacy with this kind of Behavioral Targeting. I wrote “However, ISP based ad networks also pose a bigger privacy threat than traditional BT networks, …. Phorm promises the same level of anonymity but I still think that the chances of privacy leaks are more in an ISP based network than they are in a traditional BT network. Well, according to TheRegister.co.uk BT (British Teleco) is under fire from its customer for illegal use of their data. According to the news BT used its customers’ data to test Behavioral Targeting offering, without the customers’ consent. As Behavioral Targeting become omnipresent, the question still remains “Who does the data belong to? 3rd Party Behavioral Targeting network? Like Tacoda, Revenue Science etc. 3rd party tools like toolbars etc. Now, I am not sure how all this will affect on-site behavioral targeting. The kind now Omniture is pushing with its “Test&Target” offering. I will write my views in a future post. Over the past year or so I interviewed a few web analytics professionals. In the interviews one of the questions I asked them was about the skills that they think are important for a web analyst. In this 2 part series I have compiled their responses to that question. If you are a hiring manager looking for web analyst or somebody who wants to start a career in web analytics then this article is for you. This is the second part in the two part series of "Skills required for a Web Analyst". You can read the first part at http://webanalysis.blogspot.com/2008/02/skills-required-for-web-analyst.html. "To me, the Web needs three ingredients: clear business objectives, a communication strategy and the technology to support them. The best web analyst would be savvy and top of the line in all three... which is probably impossible to find. But everyone can rate himself on a virtual scale and see where they stand and where they want to be." Curiosity and enthusiasm. I know these aren't skills so much as innate qualities, but I believe if you can go a long way as a web analyst with curiosity and enthusiasm. If you are genuinely interested in what you're doing, it shows." "Analysts work at various levels -- the most fundamental level requires some understanding of basic statistics, such as linear regression, seasonality, and simple trend forecasting, combined with an understanding of how the web "works." In other words, what do we know about browsing behavior, combined with cookie deletion probabilities, web server caching, and other artifacts of the web experience, to put our data into a reasonable context, from which we can draw useful conclusions? Beyond that basic level, though, is an understanding of organizational politics, and some fluency in "managing your message" so that the analysis you've worked hard at creating actually influences managers in making better decisions. Otherwise, you're just creating "doorstop reports," that don't help your organization, and don't really justify your efforts." "I think 2 of the biggest skills required to be a web analyst is to be able combine technical skills along with business/marketing skills in order to understand your customer’s goals and provide value to them. Secondly you have to be passionate about what you do, if you don’t like what you’re doing you will not give 100% effort." Do you agree with these Web Analytics professionals? What skills do you think are important? Let me know and I will add them to my next post. Bounce rate has become one of the most talked about web metrics, and a lot has been written about what this metrics means and how it should be interpreted and used. I also wrote about Bounce Rate in my post called Bounce Rate Demystified. This post is about the follow-up question "Ok, I understand what bounce rate is and see the importance of it, now tell me, What is the typical Bounce Rate?" To answer this very question, I conducted a survey to understand what Bounce Rates to expect for various types of sites. The sites were classified under 6 categories, ecommerce, Product Information, Lead Generation, News/Media, Branding and Other. Other was a bucket for sites that did not fit other 5 categories, some of the sites included in “Other” where social networking, online gaming, travel search engine, tool/utility, bank and training, customer support. Since most of the sites have more than one purpose, respondents were asked to select only one category to classify theirs sites based on the main purpose of the site. Let’s jump into the results. The table below shows the minimum and maximum bounce rates for the six categories. Bounce Rates ranged from 3.24% – 85%. Average bounce rate of 80 sites who responded was 40.58%. Average bounce rates were above 30% of all the six categories. News/Media sites had highest average bounce rates. This is what I had expected too, considering how users consume or reach media sites. A lot of visitors reach a news/media site via a link from another site, blog post etc. Once they read the article/news they go back to the sources that lead them there. Top entry page is the page where majority of the visitors enter the site. 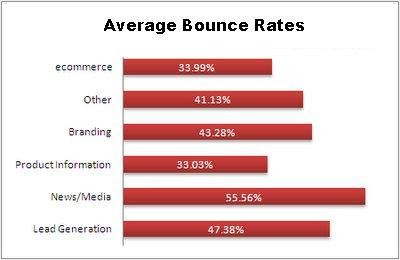 The following chart shows the bounce rates on the top entry pages of various types of sites. For all the site categories, average bounce rate on the top entry page was lower than the average bounce rate. News/Media had the highest bounce rate on their top entry pages. Again, as I said above, visitors enter news/media site via link from another site, blog post etc and go back to the source after reading the news/story. Before the proliferation of the search engines there used be one entry page to the site and that was called home page. Almost all of the visitors entered the site though the home page. Today visitors enter the site via various pages and a lot of them might not even see the home page during their visit as I saw with some of my clients and wrote in my blog post "Homepage – How critical is it". The following chart shows the percentage of sites that have Home page as the top entry page. The survey showed that Homepage is still the top entry page for majority of the sites. Except News/Media site other categories of sites had a higher Bounce Rate when the home page was the top entry page. I think when user enter a News/Media site via home page they know the brand name and are coming to look at what is currently available and use home page to dive deeper into the site. One of the possible reasons for a higher bounce rate, when home page is the top entry page, is that the home page in most of the cases is very generic and shows up in search engine results pages for keywords that might not be on the home page any more. For example an eCommerce site might have showcased an iPhone on the homepage when the site was indexed. A user searches on iPhone and lands on the sites homepage. Guess what? The site is no longer showcasing iPhone and now the product that they are showing on homepage is a Blackberry instead. What does the user, who is looking for iPhone, do? Most likely, Bounces, resulting in higher bounce rate. Considering this very impact, I had written an article called Follow the Search. Check it for a tip on how to lower the bounce rate on home page. Search, paid or organic, is one of the top traffic drivers for most of the sites. The bounce rate on Paid Search was higher for all the categories except for News/Media. This is alarming considering you are paying for all the visitors. The worst of all were Branding sites. I am sure when you talk to the marketing (or campaign managers) they will say that mission was accomplished since the user did come to the site even if they left without going any further. I agree that a visitors was exposed to brand but there is more that a marketers needs to think about than just getting visitors on the site (this is a topic for another post so I won’t go in details in this article). News/Media site showed higher bounce rate for organic search then paid and lower than paid search. Again, as mentioned above possible reason is that when visitors find a new or story via search they come to a specific story and then leave after reading it, while visitors coming by paid search are either driven to home page or a landing page and expect to dive into at least another page. The question is do landing pages affect the bounce rate? Should you have a landing page? Except for lead generation sites, majority of all other site categories did not have unique landing pages for their campaigns. As most of the sites have a Paid Search Campaigns (PPC), I used PPC to understand if Landing pages have an impact on the bounce rates. All three categories that answered the question about landing page and PPC campaigns showed that having a unique landing page for each campaign dramatically decreased the bounce rate. There was a drop of over 25 percentage points in bounce rate when unique landing pages were used as compared to when no unique landing pages were used. I hope this gives you are reason to start thinking about having unique landing pages for your campaigns. Paid search has higher bounce rate than organic search, unless you have a news/media site. If you top entry page is Home page then you can expect to have higher bounce rate. Using Behavioral Targeting can make your homepage a unique landing page on the fly and hence result in reducing bounce rates. Landing page make a significant impact on the bounce rate. Consider having a unique landing page for every campaign you run. Sponsored Message: Reduce Bounce Rate and Increase Conversion Optizent UnBounce. Convert any page into a unique landing page on the fly. I am conducting a Free Web Analytics Seminar in Bellevue, WA on Wed. 12th March from 12:00 – 1:30 PM. “Web Analytics – Building the Right Foundation” will cover topics that you should think about before you spend any money on online marketing. The seminar will help you build the right Web Analytics framework so that you can concentrate on improving the bottom line. If the word “web” comes in any part of your job title or responsibilities then this seminar is for you. Tool Selection and Implementation - "Tool selection process is like dating...Think marriage..Think long term relationship"
Building a culture of ongoing analysis and optimization - "Show me the money!!!" “Web Analytics – Building the Right Foundation” is part of an ongoing series covering topics such as Web Analytics, SEO, SEM and Behavioral Targeting. The lunch will be provided, but seats are limited so signup today to reserve a seat. Please visit ZeroDash1 to register for this event. ZeroDash1, a Web Analytics, Optimization and SEM consulting company and my employer, has partnered with IndexTools, a leader among online marketing analytics platforms. I am very excited about this partnership. Our customers rely on us to provide them deeper insights into their visitors' online behaviors and to increase their return on online marketing spend. They look to us to provide recommendations for a tool that can supply the data they require to make strategic decisions. After looking at the IndexTools' functionality and after sale support we concluded that IndexTools is an enterprise level web analytics solution that will be perfect for a lot of our clients. The functionality that IndexTools provides makes it easier to analyze the data and allows us to focus more on taking actions based on the insights we gain. In the words of IndexToools COO Dennis R. Mortensen "I cannot overstate the timeliness and utility this partnership brings. With the impressive number of enterprise level clients that have come to us with online analytics needs in recent months, we needed a new partner with Fortune 500 experience. By joining forces with us, ZeroDash1 adds to a select group of highly qualified partners that will help us bring analysis and optimization services to both new and established IndexTools clients in North America." A data-driven online marketing company based in Seattle, Washington that specializes in Data Reporting, Web Analytics, Optimization, Search Engine Marketing, and Behavioral Targeting. The ZeroDash1 team brings its 35 years of business and technical experience to make clients happy by providing creative and money saving solutions to their problems. IndexTools offers a highly customizable and scalable analytics platform for companies' online marketing activity in each phase of the customer lifecycle. With IndexTools Web Analytics and Bid Management, businesses gain accurate, insightful and timely intelligence about the effectiveness of their online marketing. IndexTools' services have boosted the online performance of more than 3500 clients worldwide, including Tesco, Vodafone, PriceRunner, and John Deere.IndexTools serves its worldwide client base directly and through a network of more than 200 local partners in over 25 countries around the globe. IndexTools was founded in 2000, and operates from three offices: IndexTools Americas - New York, USIndexTools Germany, Austria & Switzerland - Frankfurt, GermanyIndexTools EMEA, Asia Pacific - Budapest, Hungary.